Safe to say, not everything is awesome with “The LEGO Movie 2: The Second Part”. Since 2014’s “Part 1” we’ve seen two spinoff installments, including one centered around the breakout star of the first film… duh-duh-duh-duh-duh-duh-duh-duh… LEGO BATMAN! But having Emmett and Lucy (voiced again by Chris Pratt and Elizabeth Banks) together for the first time in half a decade, and then quickly breaking them apart, is one of this follow-up’s many mistakes. The main characters are separated for the majority of “LEGO 2” in hopes of creating some new magic among other central figures. It never happens. And now that we’re four LEGO films into this franchise, the cutesy, self-aware humor is becoming too overwhelming to handle. I was concerned that returning screenwriting masterminds Phil Lord and Christopher Miller would exploit their incredibly clever ending of the original. And that’s exactly what they’ve done. From the first minute to the last, there’s way too much live-action footage. We’re constantly being taken out of the fantasy brick world and placed in the real world. That’s not where a LEGO movie belongs. They, along with director Mike Mitchell (who perfectly ended another saga with “Shrek Forever After” and then nicely created a new one in “Trolls”), have concocted a “LEGO” installment that is manic, relentless and blatantly commercialized. If you’ve seen the trailers, posters and ads (or remember the end of the first film), you know that there’s a “SIS-TAR” galaxy of characters coming our way. Do I have to spell it out any more for you? This plot sends Emmett on his own adventure with a more heroic version of himself (named Rex Dangervest), while Lucy, Batman and the others get caught-up in a world that’s much… louder. Tiffany Haddish voices their leader. Need I say more? Will kids love the visual splendor and vivacious, fast-paced, action-packed, music-heavy nature of it all? Absolutely. Will some parents get sucked into the waning charm of the dialogue? You betcha. And they’ll also be shelling out big bucks for LEGO merchandise as soon as the film is over. However, it’s not hard to see past all the bright colors and in-your-face songs and question the motives of “The LEGO Movie 2”. There are structural issues from beginning to end, including a couple of aggressively confusing and conflicting themes related to sibling relations and growing-up. Individually, neither of these would have been strong enough to carry the narrative. And having both doesn’t work, either. 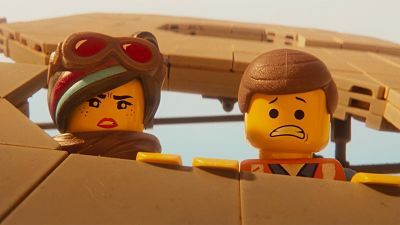 “The LEGO Movie 2” isn’t a complete fail. Some pieces fit, particularly early on. About 10% of the jokes land – and some are memorable. And there’s one celebrity voice cameo that, thankfully, doesn’t get lost in all the clutter. But this sequel never really comes together. It’s noisy, frantic and lacking in imagination – everything that playing with actual LEGOs isn’t. On The Official LCJ Report Card, “The LEGO Movie 2: The Second Part” gets a C.